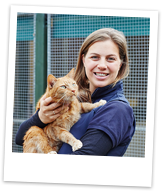 Rosie is a fully qualified Clinical Animal Behaviourist with a degree in Zoology & Psychology from the University of Bristol & a Post-Graduate Diploma in Companion Animal Behaviour Counselling from Southampton University. She is a full member of the Association of Pet Behaviour Counsellors, a member of the Association of Pet Dog Trainers (No. 1006), and registered as both a Clinical Animal Behaviourist & as an Animal Training Instructor with the Animal Behaviour & Training Council (the regulatory body that represents trainers & behaviourists to both the public & to legislative bodies). Rosie has benefitted from working with some of the world’s most respected Clinical Animal Behaviourists & continues to attend seminars/conferences & practical handling workshops to continually develop & expand her skill set (click here for a full list of all completed Continuing Professional Development courses). Spends time with her family – two boys, Jack aged 6 and Charlie aged 3; her husband Sam, an equine veterinary surgeon; two dogs Freddie and Spice; two cats Holly & Fearne; two ponies Raindrop & Bomber and five chickens.